MTA and DOT's Select Bus Service between two Queens hubs works well, despite earlier effort by local pols to slow it down. 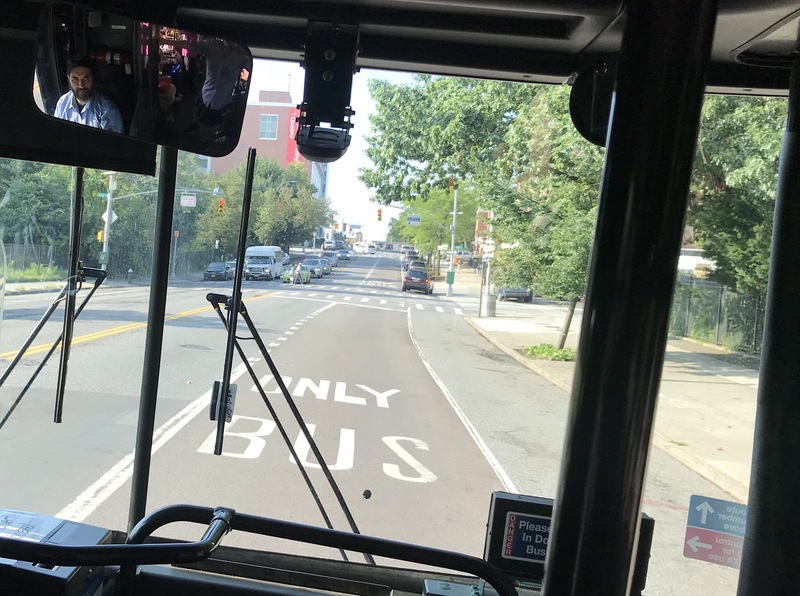 Bus service in New York City is not all bad news: The Q44 Select Bus Service between Flushing and Jamaica works — and works well. Launched in 2015, the entire Bronx Zoo-Jamaica LIRR route handles more than 27,000 trips per day, making it the 11th busiest bus in the city. It wouldn’t be nearly as efficient without dedicated bus lanes in Flushing and Jamaica, and along parts of the route between the two major downtowns. 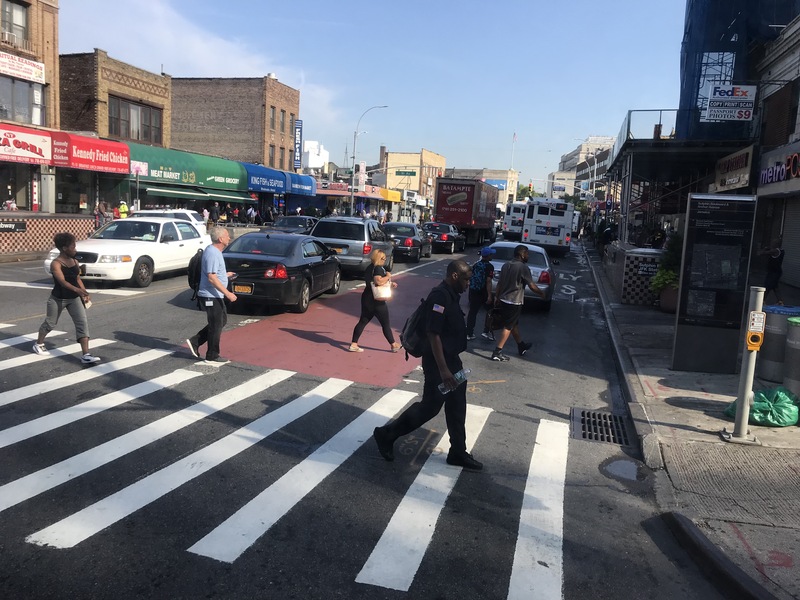 Those dedicated lanes were bitterly opposed by local pols City Council Member Rory Lancman and late Assembly Member Michael Simanowitz, who claimed that dedicated bus lanes along Main Street would inconvenience some drivers. This is most of what a driver on the Q44 sees, at least during our spot check: Plenty of room ahead. That may be true at some times of the day, but I didn’t experience such problems. My surprisingly pleasant morning on the Q44 began with a Jamaica-bound run on bus 6000, which picked me up at Main Street and 39th Avenue at 8:25 a.m. and deposited me at Archer Avenue near 168th Street just 45 minutes later. That’s an average speed of 7.6 miles per hour — not fast compared to full SBS lines, but also quite brisk for the portion of a line linking two busy downtowns. Thanks to the dedicated bus lines that so angered Lancman and Simanowitz, the only real congestion came from other buses; cars rarely ventured into the red-painted lanes, clearly conditioned by a few years of “photo enforced” ticketing. There was also very little traffic in the areas without the dedicated bus lane. A DOT spokesperson said converting the Q44 into an SBS line improved travel times by 5-14 percent, which really adds up across the entire line. Much of the traffic in Flushing is from other buses. The bus lanes are clearly needed in Jamaica, where there is substantial congestion and pedestrian traffic, but bus 6000 had no problems getting through the area, save for a small tie-up in the construction zone along Archer Avenue. 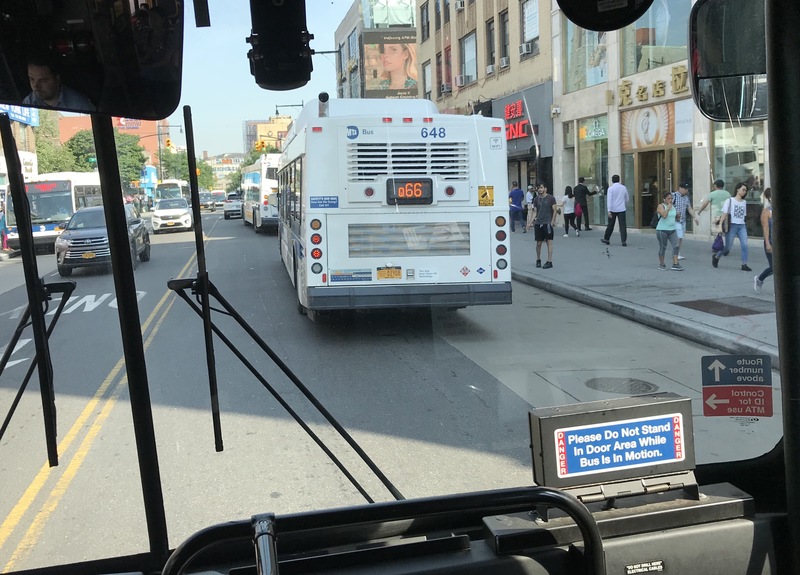 I caught bus 5999 for the run back to Flushing, which was a few minutes slower, with an average speed of 7.125 miles per hour, because of considerable traffic in Jamaica, where the dedicated bus lane becomes a regular lane of parking at 9 a.m. The bus also slowed down when it started getting crowded around the campus housing John Bowne High School, Queens College and Townsend Harris High School — packing the bus even though schools are out of session. Traffic in Jamaica is bad, but not such a problem for the Q44, thanks to dedicated bus lanes. But besides that, there were no bumps in the road until we returned to Downtown Flushing, where there was considerable traffic near the Queens Public Library branch. But still, 48 minutes from Jamaica to Flushing is a success in any bus rider’s book. I’d love to see more of these reviews. SBS has gotten a bad rap from some as not being “true” BRT, but for those of use who rely on these lines the overhauls have been transformative. Also please take a look at any overlapping local service. Unfortunately these routes take a big hit in quality of service when SBS is overlaid on top. This point also gets missed a lot. Planners don’t always get placement right as there are still plenty of chokepoints, but there isn’t anything gained putting dedicated lanes where the bus is moving. If anything it makes it harder to do them where they are most needed given the push back from pols and boards. When can we get a dedicated bus lane on the Bronx-Whitestone Bridge to shave off 10 minutes from the Q44’s travel time? What a bizarre and disingenuous article, snarking at me and the late Assemblyman Mike Simanowitz for supporting the Q44 SBS configuration that the article lauds. Yes, we opposed the dedicated SBS lane in the Kew Gardens Hills section of our districts that DOT originally proposed, because we knew that the disruption to local commerce and car commuters wouldn’t be justified by any real bus speed improvements — a fact the article recognizes! Instead, we supported other SBS features, and — according to the article — it has all worked out well.